Did you know that HGTV is giving away luxury homes all year long? Recently, they gave away the HGTV Smart Home 2015, a modern Austin farmhouse located in the historic Zilker Park neighborhood of Austin, TX valued at over $1,000,000! Why buy when you can win it? Here are two more homes you could win this year. Started earlier this month, HGTV launched the Urban Oasis 2015 Sweepstakes. This year, the winner shall win the HGTV Urban Oasis 2015, a luxury 2 bedroom, 2 bathroom, 1,300-square-foot bungalow located in Asheville, North Carolina! Plus, a 2016 Acura TLX and $50,000 in cash! A grand prize worth over $500,000! 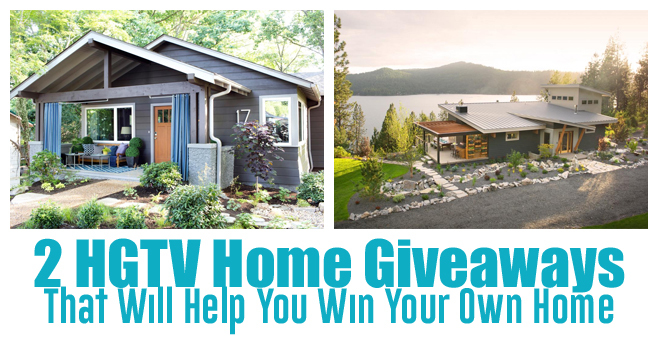 The DIY Network Blog Cabin Sweepstakes is also back! Launched in late July, this sweepstakes offers you the chance to win the mountain retreat featured on the DIY Network Blog Cabin show! This 3-bedroom, 2 ½-bathroom, approximately 4,000-square-foot new modern style mountain retreat located in Coeur D’Alene, Idaho is valued at $900,000! Grand prize also includes $50,000 in cash courtesy of Quicken Loans. Be sure to watch for the HGTV Dream Home Giveaway 2016 that should launch by the end of the year. This year, HGTV will be giving away a 3-bedroom, 3-bathroom remodel in Merritt Island, Florida! You can sign up now for reminders.